This summer I had the pleasure of being with both of our young-adult daughters. They suggested we go see the new Pixar movie “Inside Out”. The story line is about a girl whose emotions “Joy”, “Fear”, “Anger”, “Sadness” and “Disgust” basically are running the show inside a control room inside the girl. “Joy” is pretty much the leader until the family makes a cross-country move. There’s a power struggle of the emotions with an eventual emotional shutdown. Along the way, insights are provided into core memories, formation of values, etc. After the movie, our elder daughter shared that her friend, a young mother, felt the movie had created a way for her and her children to discuss emotions. The characters were so cute and recognizable; the children could talk about their own versions of “Joy”, “Fear”, “Anger”, “Sadness” and “Disgust”. I really enjoyed the movie and am glad that this type of acknowledgement of the power of our emotions has been created. I’m sure many will benefit from reading beyond the amusement of the animation. The movie failed to convey that we, the human being with the emotions, don’t have to be the victim of our emotions. We have the ability to shift control up one level … from the position of the emotions controlling us to the position of us controlling our emotions. 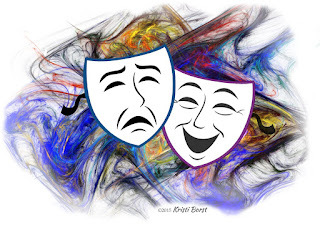 When we are able to do this, we go from being mere actors to being the playwrights, directors, set managers AND actors within, of, and through our lives. Awareness = The Power of Choice, The Power to Change.